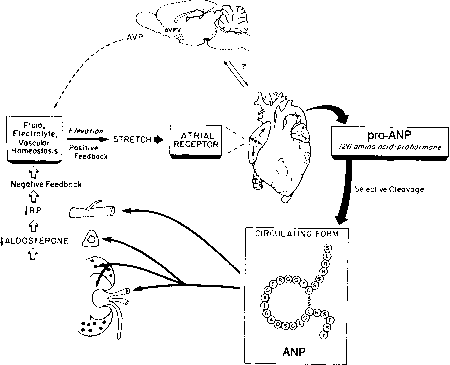 FIGURE 15-11 Schematic diagram of the ANP hormonal system. An elevated vascular volume results in cleavage and release of atriopeptin, which acts on the kidney (glomeruli and papilla) to increase the glomerular filtration rate (GFR) so as to increase renal blood flow (RBF), increase urine volume (UV) and Na+ excretion (UNa), and decrease plasma renin activity. Natriuresis and diuresis are also enhanced by the suppression of aldosterone production and its actions and by the release from the posterior pituitary of arginine vasopressin (AVP). Diminution of vascular volume provides a negative feedback signal that suppresses circulating levels of atriopeptin. 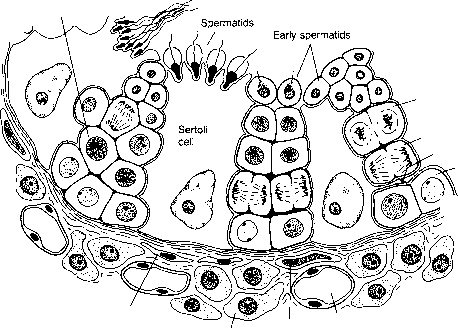 Modified from Needleman, P., and Greenwald, J. E. (1986). Atriopeptin: A cardiac hormone intimately involved in fluid, electrolyte, and blood pressure homeostasis. New Engl. J. Med. 314, 828-834.